There are two extremely important things to be learned from today’s Gospel and from the Gospels we have read during the past week, the Octave of Easter. I will come back to the fact that our Lord conferred the power to forgive sins upon the Apostles, but first we must consider the reality of Jesus Christ’s resurrection from the dead. X Jesus’ followers stole His dead body and hid it. X Jesus’ enemies stole His dead body and hid it. X That Jesus merely fainted, but did not actually die on the Cross, and was able to escape when He revived. X That accounts of the Resurrection are merely myths invented by later generations of Christians. All of these claims are ridiculous for obvious reasons. Jesus’ followers had nothing to gain by stealing the body of Jesus—in fact, quite the opposite, preaching the Gospel of our Resurrected Lord brought persecution to all and death to most of them. And the temple guard was guarding the tomb. Saint Matthew records that the guards were actually witnesses to the angel opening the empty tomb for the two Mary’s— “And for fear of him, the guards were struck with terror, and became as dead men.” —And that the guards were bribed to say that they had fallen asleep. So the “chief witnesses” to the “theft” claimed to be asleep! Jesus’ enemies had even less to gain by stealing His body. If anything, they wanted the miracle working reputation of Jesus to be forgotten as quickly as possible. Even a false belief in the resurrection would have served only to undermine the Temple and its leaders. And if they actually had Jesus’ dead body, they would have produced it a few weeks later to disprove the preaching of the Resurrection. That everyone concerned went to the wrong tomb—the Jews, the Christians, and the Romans—is beyond absurd! The theory that Jesus merely fainted and later revived would require all of His enemies—Jews and Romans—to have been incompetent. No Roman soldier would have been so negligent as to allow a living man to be taken down from the Cross—by doing so, the soldier would have risked his own execution. That is why “one of the soldiers opened up His side with a spear” to pierce His heart and leave Him unquestionably dead. Nor would the Sanhedrin just walk away from the Cross without seeing to it that their dirty work had been effectively done. 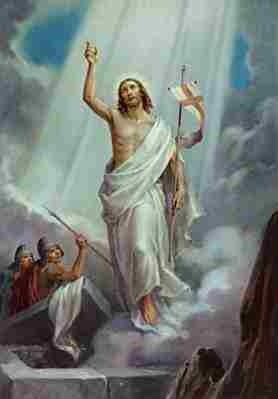 The idea of the Resurrection as a myth, formulated in the second century is contrary to all available evidence. The last eyewitness, Saint John wrote his Gospel at the very end of the first century, the other three wrote earlier. All this past week we read Gospel accounts of our Lord’s Resurrection. The tomb was empty (Mark 16:1-7, John 20:1-9), but then Mary Magdalene finds Jesus, whom she first thinks to be the gardener (Luke 24, John 20:11-18); He speaks and eats with two men on a journey (Luke 24:13-35); He convinces the Apostles that He is not a ghost or an hallucination by cooking and eating with them, and by allowing them to probe the wounds in His body (Luke 24:36-47); He worked a miracle so that they might catch fish, and then cooked and baked for them (John 21:1-14); the Apostles met Jesus at a designated rendezvous point and given the “great commission” to teach and baptize all nations (Matthew 28:16-20). Saint Paul, who was a convert from the militant persecution of Christians, wrote of the Resurrection to the Corinthians around 53 A.D., only twenty years after the Crucifixion. He explains that his doctrine comes from Saint Peter (Cephas), and the other Apostles who were eyewitnesses of the Resurrection, and by more than five-hundred witnesses who all saw Christ in the flesh, and, indeed, from his own personal meeting with Christ on the road to Damascus. When Paul wrote, many of the eyewitnesses were still around and could be interviewed. And even with the death of Saint John probably the last eyewitness, their remained disciples of the eyewitnesses who had a clear understanding. Ignatius of Antioch (AD 35-117) and Polycarp of Smyrna (AD 69-155) both left us written records of John’s teaching on the Resurrection. As did Irenaeus of Lyon (120-202), who learned of the Resurrection from Polycarp. Perhaps the most convincing proof that the eye-witnesses and near eye-witnesses accepted the literal truth of the Resurrection was that they preached it to all comers in spite of the violent persecution that lasted at least until the fourth century. Now, all too briefly, let us go back to today’s Gospel. The Apostles are in hiding—perhaps in the Upper Room—when our Lord comes to them. He was not a ghost, an image or an hallucination (as Thomas would later prove). During His public life He had been accused of blasphemy by telling people that their sins were forgiven. And now, He was telling the Apostles to do the very same! The Apostles were all priests of the New Covenant. When they offered Holy Mass they renewed the Sacrifice of the Cross, by which Jesus redeemed mankind— For this is my blood of the new testament, which shall be shed for many unto remission of sins.” They already possessed the powers of the priesthood, but now they were given the ability to exercise the power proper to God Himself—the power to forgive sins.